Made a road trip up to Oregon from Seattle which is actually pretty cool for me since living in Hawaii we really can’t take road trips anywhere since we are on an island. While there made my first stop ever at the famous Voodoo Doughnut store. 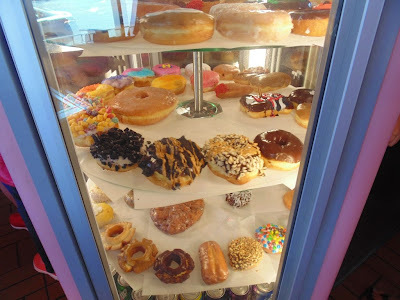 It is know for its unusual doughnuts and eclectic decor. 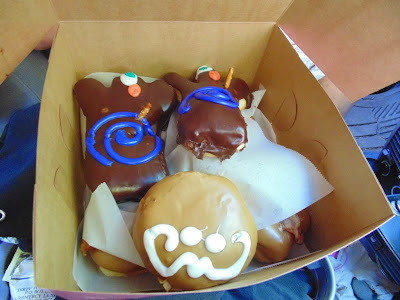 It had the namesake Voodoo Doll doughnut which is a raised yeast doughnut filled with raspberry jelly and topped with chocolate frosting and a pretzel stake. I also enjoyed their Bacon Maple Bar doughnut (not pictured here). Its open 24 hours and I’ve been told there is always a line out the door. We had to wait about 45 minutes for our treat but it was of course well worth the wait. Here we are leaving the Kitsap Peninsula across the Tacoma Narrow Bridge on our way to Oregon. This twin suspension bridge spans Puget Sound. It was opened as a single span bridge in 1950 replacing the former famous bridge nicknamed “Galloping Gertie” which opened in 1940. The original bridge collapsed four months after opening as a result of “aeroelastic flutter” caused by high winds. Luckily no lives were lost but it would become the subject of many science and engineering studies and change future bridge designs. The second span was opened in 2007. 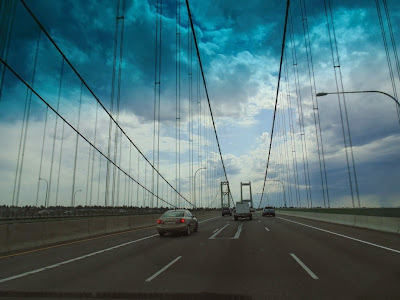 It is the fifth-longest suspension bridge in the United States. 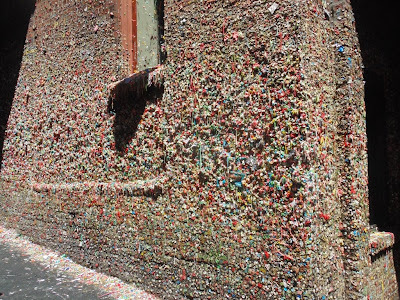 I spent a day in Seattle with my teenage nephew and he wanted to see the gum wall so being the good uncle I am we bought us some gum then ventured under the Pike Place market to the Market Theater Gum Wall to add out two cent (er piece of gum). The tradition began in 1993 when patrons of Unexpected Productions’ Seattle Theatresports stuck gum to the wall and placed coins on them. Workers scraped gum away twice and gave up. In 1999 it was deed a tourist attraction. The 2009 Jennifer Aniston film Love Happens has a scene at the wall and a good number of tourists came by while we were there posing for photos and adding gum to the wall. My @HawaiiBlog Instagram followers experienced a preview of this while I was in Seattle. Be sure to follow that or the @HawaiiBlog Twitter account for bonus photos.